Asppice Engineering deals in plastic / metal cable carrier for electrical hoist crane cable carrier for crane. Due to years of practice of this area, we are providing a high-class range of Plastic Cable Carrier that meet on consumer’s demand. 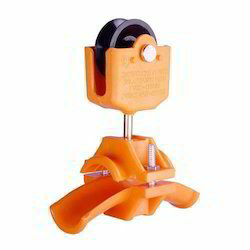 We have a wide range of Plastic Cable Carriers and are the market leaders in terms of supply of the same. We offer a wide range of VARIO-LINE Cable carriers with variable chain widths to our clients. - Simple & quick assembly due to snap fitting. We are offering a wide range of Engineering, which provide protection for power supply cables or hoses and support them for smooth and sure movement on machine and equipment. With the help oh these chains, the hoses or cable move smoothly in a circular motion. As a result frequent movement will have no effect on oil pressure not will there be any breaks in the electrical current. We supply high quality Plastic cable drag chain with simple design for standard applications which areOur scope of supply ranges from small units of only a few milli metres as for an inkjet printer to giant chains for oil platforms where the chain weighs several tones.